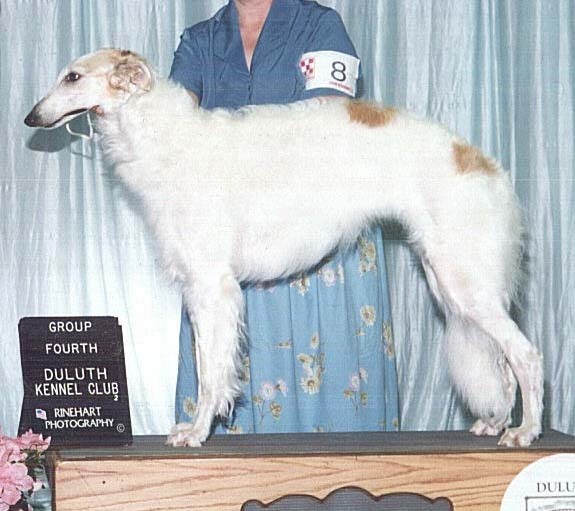 "Tess" finished with a Hound Group 2nd and a Group 4th from the classes, breeder/handled; she is owned by Sharon Robinson, Mulberry Street. She was a sweepstakes BOS as a youngster and a Specialty Best of Opposite as an adult. One of the Waterbabies, "Tess" is out of CH Stillwater Coolwater, ROMX-C sired by our Am. Can. CH Greyhaven Mahogany Trinrose.